Spotted salamanders have always attracted a cult following of fans due to their submissive nature, ease of captive care and relative obscurity in the pet trade. Spotted salamanders have always attracted a cult following of fans due to their submissive nature, ease of captive care and relative obscurity in the pet trade. Everyone I know of that has kept this species still keeps them to this day and has nothing but praise for them. Spotted salamanders average 6 or 7 inches, but can attain lengths of almost 10 inches. Female spotted salamanders grow noticeably larger than male spotted salamanders. A pair of adult spotted salamanders or several juvenile spotted salamanders may be kept successfully in a 10 to 20-gallon vivarium. The more spotted salamanders you add, the larger the vivarium should be. A thick layer of dampened substrate is necessary for spotted salamanders. I personally use ground pine bark mulch, which provides great moisture retention and high acidity for the reduction of harmful bacteria and fungus. This mulch also enables ease of burrowing for the spotted salamanders. If ground pine bark mulch is not available, ground peat moss, sphagnum moss or coconut mulch will suffice. Avoid substrate with strong odors or harsh oils, such as cedar mulch. Keep the substrate damp, but not wet, and change it completely once a month. Naturalistic décor such as logs, bark slabs and similar items can also be used. Be sure cage furnishings do not have sharp or rough edges that could damage the salamanders’ delicate skin. Spotted salamanders are primarily subterranean and require very little actual light and no full-spectrum light is needed at all. Spotted salamanders are fine with no light beyond ambient room lighting. If you prefer lighting over their enclosure, I recommend non-heat-emitting fluorescent lights. Spotted salamanders like it cool and will be most active when temperatures are within the 50 to 70-degree Fahrenheit range. Do not use an additional heat source, such as an aquarium heater, with spotted salamanders, and avoid temperatures higher than 75 degrees maximum. In nature, hungry spotted salamanders will be attracted to virtually anything that moves that they can overpower, including other salamanders. Captive spotted salamanders have voracious appetites that will be satisfied with invertebrates such as earthworms, crickets and an occasional pinkie mouse for adult spotted salamanders. Active spotted salamanders can be fed three times a week. In nature, late winter and early spring rains awaken spotted salamanders from their subterranean hibernation and bring them to the surface to breed. Male spotted salamanders may travel long distances to arrive at the temporary vernal pools where they themselves were produced. The male spotted salamanders will typically arrive first and scatter spermatophore in the form of small, white cones beneath the water. Female spotted salamanders arrive a day or two later and are prompted by anxious males to pick up the sperm cones with their swollen cloaca. Fertilization takes place internally and up to 200 eggs are laid in a jellylike smear. This substance rapidly absorbs water and creates a clear protective cushion around the eggs. Green algae sometimes grow within the gelatinous egg mass and increases oxygen levels that help increase larval development. After 30 to 60 days, the larval spotted salamanders hatch and leave the egg mass. Fully aquatic and equipped with gills for breathing underwater, they feed immediately upon algae and aquatic invertebrates. After two or three months, the fully formed spotted salamanders leave the water for a life on land. The juvenile spotted salamanders will develop spots within a week after leaving the water and become sexually mature after about three years. In order to successfully breed spotted salamanders in captivity, many of their natural stimuli and environmental needs must be met. This is difficult, if not impossible, to do indoors. If you live within the natural range of spotted salamanders, outdoor propagation can be attempted by constructing an area approximately 8 feet by 12 feet utilizing wooden or concrete walls sunken into the ground to a depth of about 10 inches. A shallow pool of water approximately 4 feet in diameter is necessary for laying eggs. Adult spotted salamanders should be left in this shaded enclosure year-round to condition them to a natural reproductive cycle, and they typically breed in the early spring. Plenty of loose earth, a substrate such as sand, and high-acid forest debris in the form of deciduous tree leaves will enable your spotted salamanders to burrow beneath the frost line for hibernation during the winter months. Juvenile spotted salamanders, once hatched, should fare well if left in the outdoor pool throughout the summer, until they are developed for land travel. At that point, they can be cared for indoors, if desired. Be sure to watch pool water levels and monitor developing larvae frequently. Because spotted salamanders have soft, delicate skin, it is best to handle them as little as possible. If you must handle them, always do so with clean, wet hands. This gentle species will never try to bite and will typically put up no fight in your hands aside from an initial struggle. Keep in mind that a spotted salamander’s body temperature will increase rapidly from your own body temperature, and this can be harmful to the salamander. 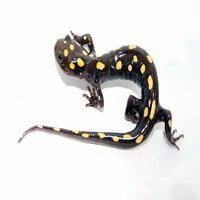 Hold it safely over your lap or close to the ground with open hands, in case the spotted salamander squirms out of your grip. Always rinse your hands with cold water before handling a spotted salamander, and keep handling to a minimum. Clean the box out every 2 to 3 months with warm water and mild dish soap. Don't use chlorine disinfectant to clean it, as even remnants of chlorine may harm the salamander.